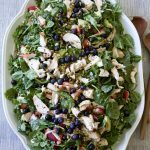 Grilled Chicken and Kale Salad with Apricot Vinaigrette is the perfect way to celebrate the end of a long cold winter and the unveiling of SPRING! 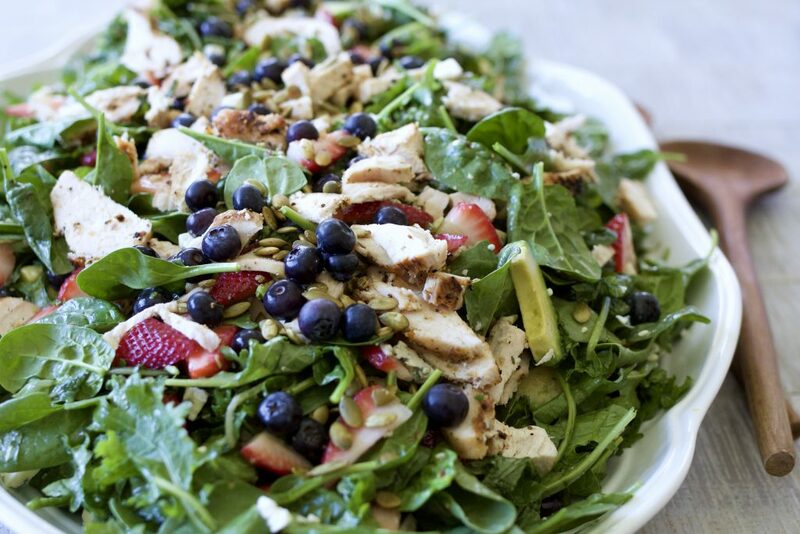 This salad combines grilled chicken, fresh kale, spinach, seasonal berries, creamy Gorgonzola or Blue cheese, crunchy pumpkin seeds and sweet Craisins, all topped with my homemade apricot almond jam (you can also sub store bought or honey) in a simple vinaigrette. Basically, every girl’s dream in a salad. Kale has lots of health benefits, and while I’m not usually a super health conscious eater, I try to make sure to eat my greens. Kale is high in fiber, has no fat and is very low in calories. It is usually inexpensive (especially if you purchase it in a bunch, and wash and trim it your self). Kale is loaded with calcium, which the never ending, cannot get enough of, in my system vitamin or is it a mineral? Whatever it is, I never consume enough. Kale is filled with anti-oxidants, which help prevent cancers. Oh, and constipation issues? Kale can help. Kale is also high in vitamin C and A. Are you low on iron? Kale to the rescue. It’s basically a miracle food. When is the last time you talked about massaging your salad ingredients at a luncheon? Never. But here’s why I’m sold on massaging kale. One reason why kale is not particularly popular among many people is the tough texture. In my opinion, eating raw kale is about as appealing as eating roof shingles. Oaky, maybe not that bad, but close. 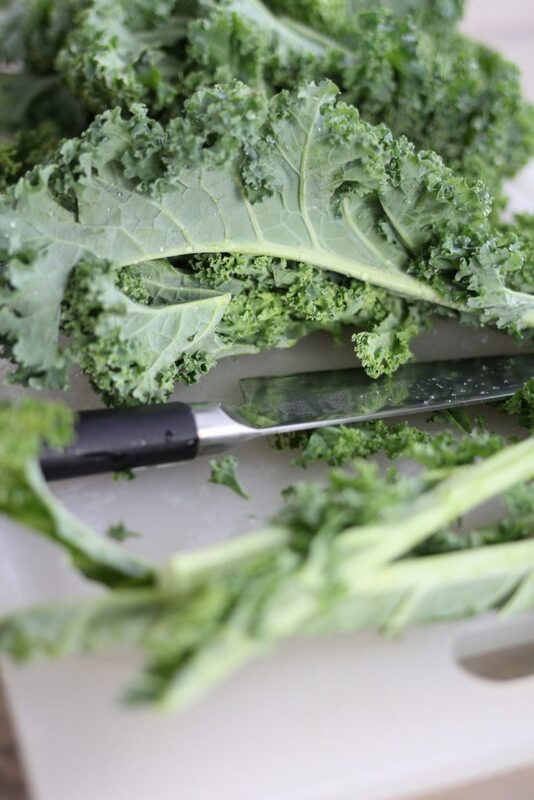 I learned the secret to tenderizing kale a few years ago you can read about it on this post. The key to tenderizing kale for salads is to massage the kale. Since discovering this trick, my attitude toward eating kale has completely changed. Throw on the food handlers gloves, squeeze (favorite hand held juicer) a fresh lemon (helps tenderize kale) over the kale and in a few seconds the kale is transformed into perfect salad material! It will reduce about 1/3 to 1/2 in volume after being massaged, making it tender enough to enjoy in any salad. Grilled Chicken and Kale Salad with Apricot Vinaigrette includes a marinade made of Sprite, soy sauce, oil, and seasonings. The marinade tenderizes the chicken perfectly and is easy to make ahead and set in the fridge until you’re ready to bake or grill. I set the grill on medium-low heat and cook for about 8-10 minutes per side (depending on thickness of chicken breast), turn once and check to make sure it is done. Adding chicken to a salad makes it a main dish meal, which means less cooking, dishes at the table, etc. I’m a big fan of serving a buffet at a wedding or baby shower which includes a main dish salad. 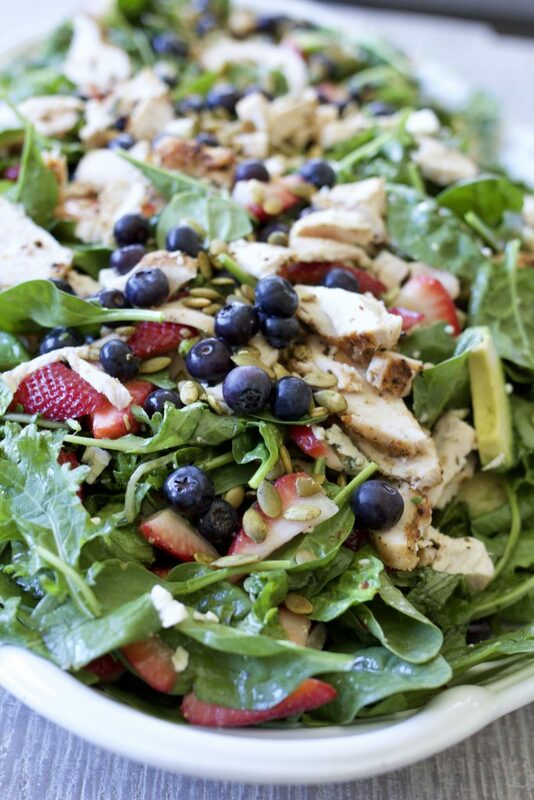 You can easily build a whole menu around a salad like this that includes chicken, greens and fruit. I promise no one will go away hungry if you add chicken to your salad! 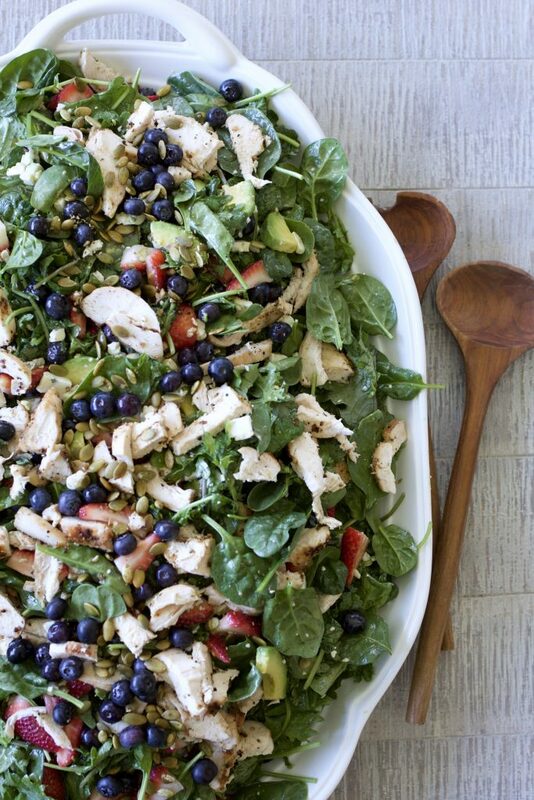 Grilled Chicken and Kale Salad with apricot Vinaigrette lots of thumbs up! 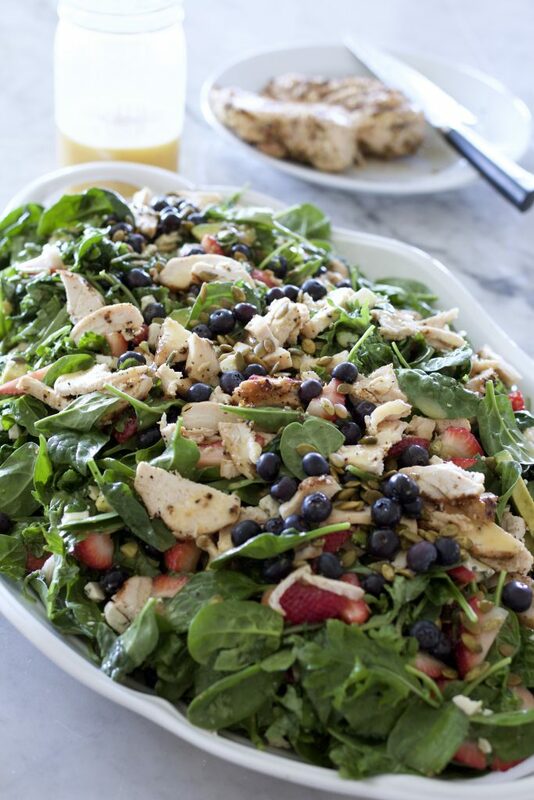 Grilled Chicken and Kale Salad with Apricot Vinaigrette will be the hit of your next gathering! Everyone loves it. Even Grant, who is not a huge fan of kale, or salads, or most green things. Perfect for a lunch with your favorite girlfriends, wedding or baby shower, or as an accompaniment to almost any grilled main dish. When I make this as a side salad, I make it without the chicken. 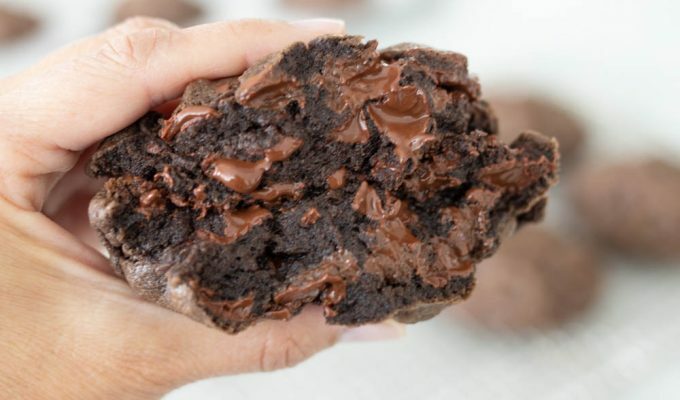 Serve this with a loaf of Diane’s No Fail French Bread, a pitcher of Homemade Lemonade and Frosted Nutella Chocolate Chip Cookies for an unforgettable meal! Place the marinade ingredients in a ziplock bag and whisk. Add chicken to bag and place in refrigerator for at least 1-4 hours, or overnight. When ready to grill, remove chicken from bag and discard marinade. Grill over medium heat for about 8 minutes per side. Remove from grill when cooked, let cool and slice chicken against grain. Set on plate and refrigerate until ready to serve. Meanwhile, make the dressing by combining all ingredients in a blender or use an immersion blender to mix well. Refrigerate until ready to assemble salad. To assemble salad, place kale in a large bowl or on a platter. Squeeze fresh lemon over kale and using hands, massage the fresh lemon juice into the kale to break down the fibers in the kale. Gently toss the spinach with the kale. Do not massage the spinach! Arrange the remaining salad ingredients on top of the fresh kale and spinach mixture. Drizzle with prepared dressing and serve remaining dressing on the side of the salad. Serves 6 as a main dish salad, or 10-12 as a side dish. Notes:-When serving as a side dish, you may omit the chicken. -The marinade is enough for 6-8 chicken breast halves. 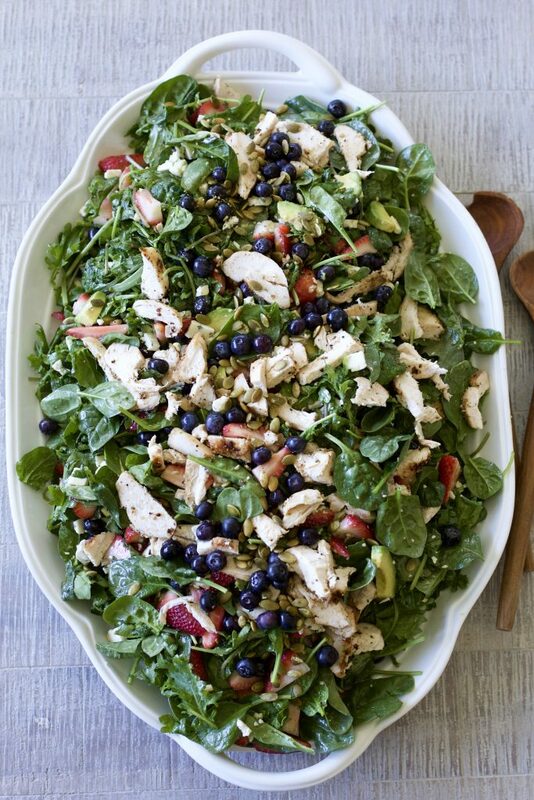 -If preparing salad ahead, add avocado and pumpkin seeds to salad, and dress salad just before serving.-I often grill extra chicken, cool ,slice and then use throughout the week in salads, pasta dishes or to throw in grilled tortillas with cheese and then add lettuce for a quick lunch! Wish I knew why I can no longer print from your website. I just get a blank page. This salad is DELICIOUS! The kale massaging made such a difference! Everyone I shared this with is asking for the recipe! I used honey in the dressing, and it was delicious! The chicken alone is fabulously tender and flavorful! Thank you! Thank you! I made this several times this summer and always received glowing reviews and lots of recipe requests! Thanks for reading ABK! I made this salad for a luncheon. It was delicious! Thank you!